Gov. Edgar Chatto vowed in his impressive State of the Province Address (SOPA) to conquer the greater challenges while he keeps on building a better Bohol in the finale of his administration. “We do not pursue our vision and mission in vacuum. We pursue them always with the end in mind of making a positive impact on the Boholanos,” the governor said. Chatto delivered his eighth SOPA and most important singular annual governance report before the Sangguniang Panlalawigan (SP), led by Acting Vice Gov. Venzencio Arcamo, in special session at the Bohol Cultural Center. “We do not intend to just paint a rosy picture and assume that everything is going well. There are challenges. We focus what we can do about them, rather than be immobilized by them,” the governor said. He recognized the major challenges ahead and, together with all stakeholders and partners, committed to continue the trend of poverty reduction and sustain the robust business climate. The implementation of power and water investments will be fasttracked while sustainable tourism development, including barrier-free tourism, ensured. The governor also underscored as major challenges the growing traffic concern and promotion of seamless travel. To generate both unprecedented air and land traffic volume, the new Bohol Panglao airport of international standard will begin its commercial operation in August as scheduled. 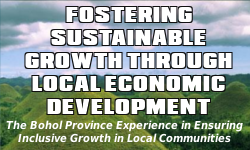 Capitol will be more aggressive in enhancing Bohol’s capacity to become a center of development and excellence in agriculture, tourism and information communications technology. In the wake of the country’s tough tax reforms that invite inflation and affect the currency’s purchasing power, Chatto enjoined all to vigilance in managing the prices of prime and basic commodities. The Boholanos are likewise challenged by the preservation of peace and security and promotion of public awareness and understanding on constitutional change towards federalism. “I would like to leave you with images that will make you even more excited, more optimistic, and more determined about Bohol’s future,” the governor thrilled his SOPA audience. Using slides, Chatto gave updates on the completing and upcoming major projects topped by the Bohol Panglao airport, new Provincial Capitol, Bohol National Museum, improvement of the CPG Sports Complex, and Bangko Sentral ng Pilipinas (BSP) full Bohol branch. In anticipation of the development upsurge owing to the new airport, the offshore bridge connector or third Tagbilaran-Panglao island bridge project already has a complete feasibility study, the governor said. The P4.2 billion project will have an initial funding from DPWH in 2018. The construction of the Central Bank in Tinago, Dauis—near the Panglao airport—will finally start in the last quarter of 2018 after the signing of the deed of absolute sale of the lot right on the SOPA day. After the signing witnessed by Chatto himself, the BSP officials led by Asst. Gov. Iluminada Sicat, managing director of the BSP Regional Monetary Affairs Sub-Sector, attended the SOPA ceremony. The governor likewise gave updates on the making of Bohol as the dairy capital of the Philippines, modernization of the Gov. Celestino Gallares Memorial Hospital (GCGMH) costing P2.2 billion, and construction of the Bohol Youth Home and Bohol Drug Rehabilitation Center. Chatto said information communications technology hubs and economic zones registered under the Philippine Export Processing Zone Authority will be launched this year, creating more jobs. He also mentioned the proposed Bohol International Convention Center, which is envisioned to be achieved with public-private sector investments to hopefully host APEC, ASEAN and other international gatherings. The One Bohol Power Project for Sustainable Long-term Power Supply will soon be open for competitive bidding for affordable, reliable, environment-friendly, sustainable and resilient power supply. The Bulk Water Supply Project for the clustered towns is also up for bidding as its procurement process is now underway. This is aside from the investment of the Richli Corporation, which water supply development and distribution project is ongoing. There are more long-term projects in the pipeline as identified in the Provincial Development and Physical Framework Plan over the next 12 years. 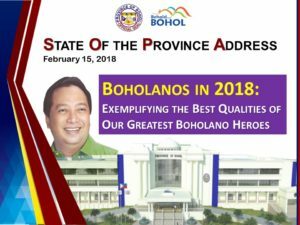 In a powerpoint presentation, Chatto articulated last year’s accomplishments of the province by each of the programmed development pillars of the so-called “InsPIRED HEAT-IT,” Bohol’s overarching agenda. The acronym stands for Infrastructure, Social well-being and shelter, Peace and order, Interconnectivity, Reforms in local governance, Equitable economic growth with environmental sustainability, and Disaster risk reduction and management/climate change adaptation. Under infrastructure, for instance, the length of concrete-paved provincial roads increased, in 2017 alone, by 81% and asphalt roads by 58% while gravel decreased by 29%. “Our various Road Projects for implementation in 2018 will see the concreting of another 75 kilometers’ length of roads throughout the province,” Chatto said. Building better roads has been aggressive through special and convergence programs such as the Conditional Matching Grant to Provinces (CMGP) or KALSADA and World Bank-funded Philippine Rural Development Project (PRDP), the latter thru the Department of Agriculture. Another strategy is the convergence between the Department of Tourism (DOT) and Department of Public Works and Highways (DPWH) as mandated under the National Tourism Act of 2009. Chatto principally authored the law while he was congressman of the First District and chairman of the Committee on Tourism of the House of Representatives. The Road Leveraging Linkages for Industry and Trade (RoLL-IT) under the Department of Trade and Industry (DTI) this year involves 22 local road projects costing P614.60 million. Local bridges have been completed through the DPWH – Department of Agrarian Reform (DAR) convergence program. Under social-well being, 3,496 core shelter units have been constructed as a major aspect of post-earthquake recovery. The rehabilitation housing has been funded by the Department of Social Welfare and Development (DSWD) and implemented by the Habitat for Humanity and International Office for Migration (IOM-Philippines). The provincial government itself funded another 243 units of core shelter. On peace and order, particularly the house tagging with “Drug Abuse-Free Home” stickers, a total of 52,058 stickers were already posted since December 30 last year to January 25 in 2018. In his SOPA, Chatto again honored the fallen government troopers and heroes during Bohol’s victorious resistance to the Abu Sayyaf entry, which was totally crushed last year. On interconnectivity, the governor highlighted the strategic and purpose-driven linkages and partnerships with the national agencies, local government units, civil society organizations, private sector, and Overseas Development Assistance (ODA) agencies. He cited the reforms in governance, but the governor would still seek constant improvement in the internal structures, systems and processes as the province’s annual budget fattened from P1.8 billion two years ago to P2.9 billion in 2018. Highlighting many continuing initiatives, Chatto said these will keep “hand in hand with our overriding concern for environmental sustainability. The Bohol government scored an “A-1” in Environmental Management System, in which the auditors found zero minor and major non-conformities during their surveillance audit. Disaster risk reduction and management and climate change adaptation initiatives will be more capacitated. More TaRSIER 117 sub-stations, like the forthcoming one in Loon, will be established. The health and sanitation programs “should not relax” when it comes to looking after the well-being of the Boholanos, the governor said. Chatto acknowledged the foreign surgical-medical missions in Bohol being facilitated by the Philippine Gift of Life under its power woman, Francisca Baluyot, also regarded as a humanitarian icon. Chatto pledged more support to education and skills development. On agriculture, the development of strategic initiatives must enhance while Bohol’s envisioned status as the country’s dairy capital is programmed to gain momentum this year. With the Ubay Stock Farm as breeding site for Girolando cattle from Brazil, Bohol is projected to increase dairy animal and milk production from 1.8% of the national requirement to 10% by year 2022. Farm mechanization will continue even if Bohol’s 48% increase in rice production last year posted the highest by a province in the entire country. Based on official government statistics, Bohol is challenged by the recent decline in vegetable production, although commercial farms still supply the markets. He pledged a government that keeps coordinating closely on the information communications technology advancement, which is private sector-driven. The governor anticipated the development of Bohol as the regional cultural hub, with full support from the National Commission for Culture and Arts (NCCA). In his SOPA, Chatto still mourned the loss of Boholano movie and television director Maryo delos Reyes, a Philippine film industry icon. Chatto acknowledged the strong support of the national government led by the country’s foremost chief executive, Pres. Rodrigo Duterte. The governor led the officials of the Bohol LGUs who met with the president in Cebu days before Chatto’s SOPA. Chatto said the president told the local officials in the nationwide to do their mandate and job. The governor also thanked for the partnership with and support of Bohol’s provincial board and the rest of the provincial government, the three congressmen, 47 mayors, all other LGU officials, private sector, and Boholano community in general. Relampagos refiled his bill upgrading and doubling the Gallares hospital’s capacity from existing 225 beds to 525 beds, as well as the renaming of the hospital into the Gov. Celestino gallares memorial Medical Center (GCGMMC). The bill was already approved by the House Committee on Health and Relampagos expected it to be passed by the House and adopted by the Senate en route to becoming a law. Bohol had no vision until Relampagos and Chatto, then the governor and vice governor, respectively, called a multi-sectoral summit defining the province’s vision, mission and goals.